For all those who choose to get out and play this winter instead of hibernating until the first sign of spring, Hamilton Halton Brant has a flurry of adventures to choose from. 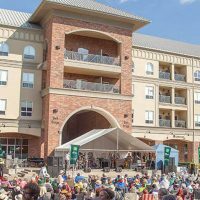 When the flakes fly, embrace your snowy side with plenty of outdoor options, from skiing to ice fishing and snowshoeing to winter walks. We’ve got recommendations for winter warriors and reticent snow bunnies alike – check our rating for each experience before you head out. No matter which adventure you choose, smile – it’s snowing! Step up your hiking game and try snowshoeing instead! 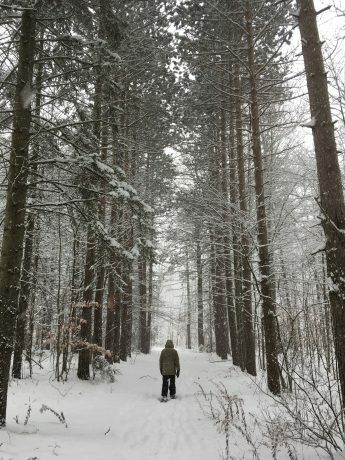 It has been said if you can walk, you can snowshoe, and it is a great way to enjoy the trails at local conservation areas. 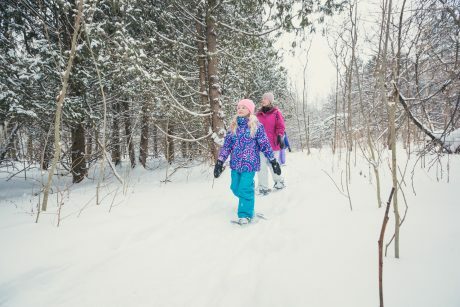 Winter wanderers will love snowshoeing at Pinehurst Lake, Crawford Lake, Mountsberg, Hilton Falls, Christie Lake, Valens Lake, Terra Cotta, and Dundas Valley conservation areas. 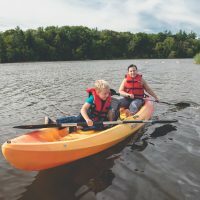 If you don’t have your own equipment, head to Pinehurst Lake, Terra Cotta or Crawford Lake, where rentals are available. Crawford Lake also offers sunset snowshoe hikes for families and moonlight snowshoe hikes for adults every Saturday during the winter season. Sunset Snowshoe Hikes for families provides an opportunity for groups with children to enjoy a less strenuous hike, snowshoe games and fun nature activities (tracking, anyone?). Moonlight Snowshoe Hikes for adults (age 14 and up) offer insight into the history of snowshoeing, provide instruction on snowshoe techniques and include a more strenuous guided moonlight hike on the Crawford Lake trails. Both experiences end with a tasty mug of hot chocolate and a marshmallow roast around the campfire. The time-honoured Ontario tradition isn’t just for the summer! 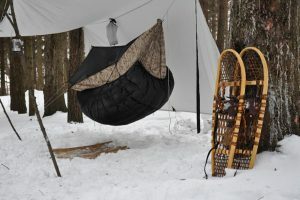 There are three different conservation areas that offer winter camping in Hamilton Halton Brant. If the idea of a snowy site appeals, you can reserve at Valens Lake Conservation Area, Rattlesnake Point Conservation Area, or Kelso Conservation Area, which has two winter campsites available by request. 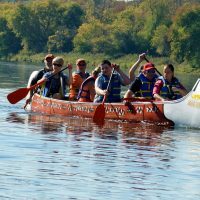 Head out on a nature interpretive adventure during a guided winter hike through the Grand River Valley. 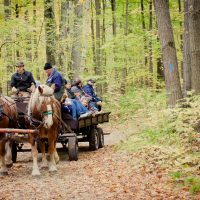 The experienced guides at Grand Experiences will take you through conservation lands where you’ll see wildlife in their natural habitat, search for animal tracks and spot bald eagle nests. You may even catch a glimpse of the amazing eagle returning from a hunting trip or feed a chickadee from your hand. An advanced version of this trip teaches you winter survival skills in the forest and includes a campfire cookout. 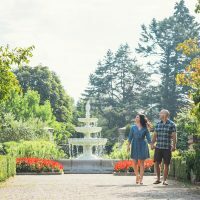 Pull on those long johns and head to Hendrie Park at Burlington’s Royal Botanical Gardens for family winter walks. From mid-November to just before Christmas, guided walks are offered twice daily on weekends with one of Santa’s helpers. 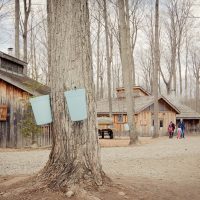 After Christmas, throughout the school break, the walks are offered twice daily, giving kids the chance to discover how the forest has changed to survive the winter. 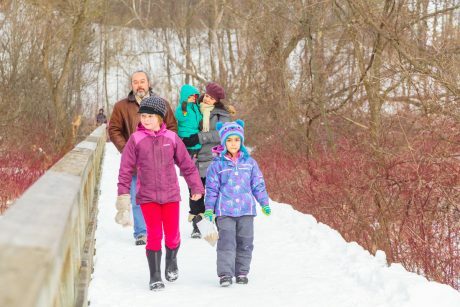 Free Back to Nature Hikes are offered to everyone each Sunday throughout the winter. 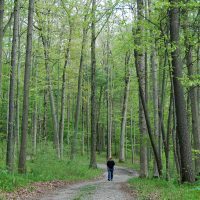 These walks are designed for those looking to explore the vast ecosystems of RBG’s lands. 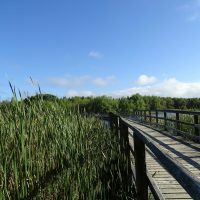 Visitors are also welcome to explore on their own, and with more than 27 kilometres of nature trails and four main trailheads throughout RBG’s nature sanctuaries, the hiking opportunities are almost endless. 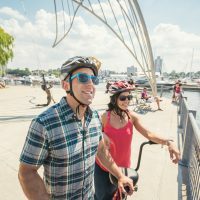 You can create your own route and self-guided tour with resources including downloadable maps, trail conditions information, and a user guide. 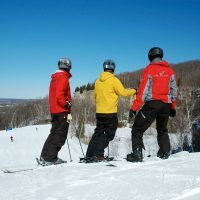 Fantastic downhill skiing and snowboarding on the Niagara Escarpment is less than an hour’s drive from downtown Toronto at Milton’s Glen Eden. Located on the Niagara Escarpment facing north, Glen Eden is privy to colder nights early in the season. This microclimate, coupled with new snowmaking gun technology, has helped the Ski Centre to open earlier and cover the slopes with snow, even in mild temperatures. 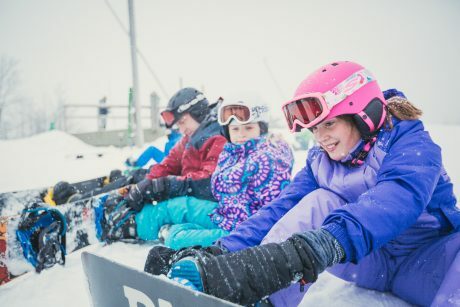 Their slopes offer ski and snowboard rentals, group and private lessons, six lifts, 12 runs, and three terrain parks with 5-35 foot jumps plus rails and boxes ranging from small ride on features to air on double kink hand rails. Conservation areas in Hamilton Halton Brant offer cross-country skiers and amazing access to Niagara Escarpment trails during the winter months. 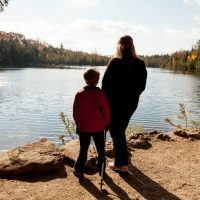 Valens Lake, Christie Lake, Pinehurst Lake, Terra Cotta, Hilton Falls, and Mountsberg conservation areas all boast between 10-16 kilometres of trails. 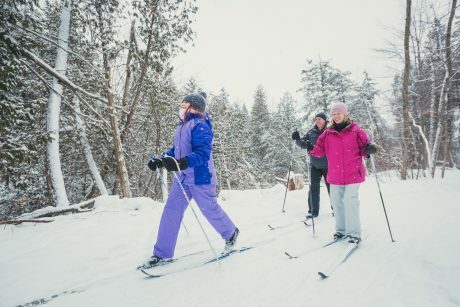 Cross-country ski equipment is available for rental at Hilton Falls and Terra Cotta conservation areas. For a truly unique experience, Hilton Falls Conservation Area in Milton helps cross-country skiers take to the trails under the light of the moon. Following the excursion participants warm up beside a crackling bonfire while sipping hot chocolate and roasting marshmallows. 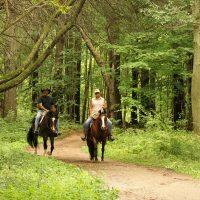 Other trail options in the region include the 32-km Brantford to Hamilton Rail Trail, a frosty favourite of avid cross country skiers, or for those looking for a shorter ski, the SC Johnson Trail, which runs 14 kilometres between Paris and Brantford. We’ve got plenty of venues where you can get outside to “sharpen” those skating skills. Experience Hamilton’s waterfront at the Pier 8 Hamilton Waterfront Outdoor Rink, where you can warm up with a S’mores Latte or Candy Cane Hot Chocolate at the café overlooking the NHL-sized rink. 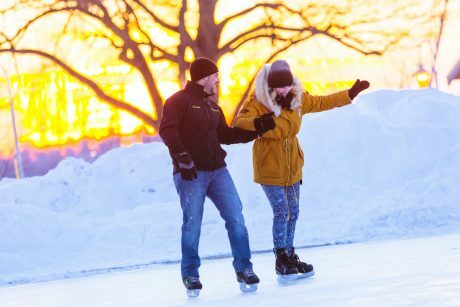 Another waterside option is Burlington’s Discovery Landing, where the 10,000 square-foot Rotary Centennial Pond offers recreational ice-skating on an artificial ice surface. Harmony Square in downtown Brantford is home to another wonderful outdoor rink, and Terra Cotta Conservation Area, offers ice skating on their frozen pond and trail. Skating is free at all of these venues, and all operate seasonally. 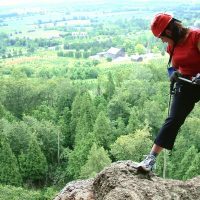 Local outfitter One Axe Pursuits will gear you up and teach you everything you need to know to hack your way up Ancaster’s frozen Tiffany Falls with an ice axe this winter. Their six-hour Introduction to Ice Climbing course is suitable for complete beginners as well as experienced indoor gym climbers. 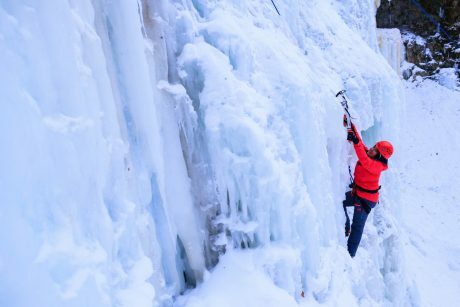 Get a taste for this invigorating winter sport by watching this Tiffany Falls ice climbing video. Don’t save the fun of fishing for summer! Ice fishers can head to Valens Lake, Binbrook, Fifty Point or Pinehurst Lake conservation areas to sink their line. Fish for northern pike, black crappie, bluegill, pumpkinseed, and yellow perch at Valens Lake, for perch, pike and brown trout at Fifty Point, and for blue gill and black crappie on a frozen 23-acre kettle lake at Pinehurst. 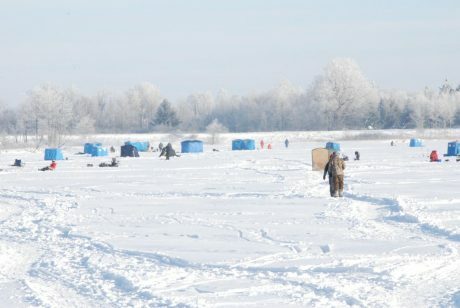 Binbrook offers ice hut rentals during ice fishing season and hosts a popular ice fishing derby in February. For free frosty fun, plan your fishing trip around the designated Ontario Family Fishing Weekend in February, when you can fish without the need to purchase a fishing license. We’ve got even more chilly thrills and ideas to plan a winter day trip that will take just a short drive from much of southern Ontario. 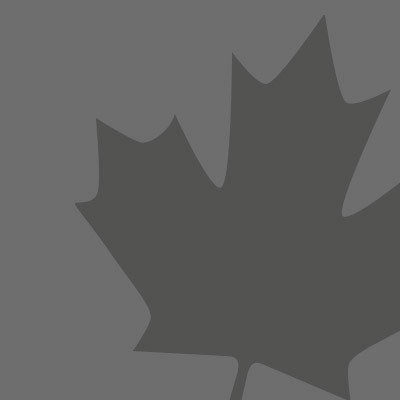 If you’re looking to chase away the winter blues and celebrate like a true Canuck, be sure to check out all of the season’s best events. Cost: $55 for 1 adult and 1 child. Pre-registration is required. Time: 7:00 PM - 9:00 PM Cost: $30 per person. Pre-registration is required, weekends only. Cost: $30 per person. Pre-registration is required, weekends only. Based on standard rooms only. 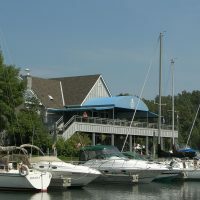 Rooms are subject to availability. Reservations required to the Arlington Hotel directly. Package not applicable with any other offer. Offer not available Monday and Tuesday nights, as Edit. Restaurant is closed on those evenings. Cancellation Policy: 48 hours notice to avoid room charges. Get your country on in Hamilton Halton Brant.